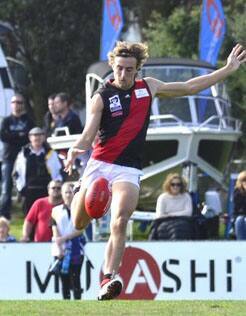 A quad injury to Aaron Francis has further soured a 28-point loss to Sandringham at Trevor Barker Beach Oval on Sunday. Inaccuracy cost the Bombers, failing to make the most of their opportunities while the Zebras managed to kick away late, winning 15.13 (103) to Essendon’s 9.21 (75). Playing just his third VFL game of the season, Francis took no further part in the game after coming from the ground late in the first term with a quad injury. The Bombers were within striking distance at the three quarter time break, but couldn’t stem the flow of the Zebra’s lively forward contingent. The home side got away the ideal start with the opening two majors before Jayden Laverde was able to convert from long range towards the social club end. Two more from Sandringham opened up a handy advantage but a lovely goal from skipper Daniel Coghlan and the fend-off and then goal from Mason Redman right on the quarter-time siren cut the margin to four points. Sandringham’s ability to move the ball with speed right through the middle of the ground was a key area to address for the coaches at quarter time. Some great work from Coghlan on the wing found Sam Heavyside who kicked to the advantage of Jack Langford to give the Bombers their first lead of the day early in the second quarter. Two quick goals from the Zebras ensured that the advantage was short lived and another from Jack Lonie, one of his five for the afternoon, gave the Zebra’s a 21-point lead before a miss from Shaun McKernan right on the half time siren cut it by one. The start of the third term was an enthralling contest between two sides desperate to gain the upper hand with either side only able to add a minor score before the Zebras were able to kick two quick goals, making it six in a row, to push the lead beyond five goals. Two goals from Laverde kept the Bombers in touch with goals from Redman and McKernan igniting some real belief after some reward for effort and repeat entries inside forward 50. Zebra captain Trent Dennis-Lane steadied his side with a much needed major, but Conor McKenna provided one of the highlights of the day with a give-and-go goal on the run shortly before three-quarter time at which the Bombers trailed by 13 points. The healthy turnout of fans wearing red and black were urging their players as they came out of Matthew Egan’s final address. The Bombers had their chances early in the last quarter but again it was Lonie who made them pay with a classy goal. Any chance of a comeback win was lost when Jack Langford hit the post after marking strongly late in the term. Coach Matthew Egan said the Bombers came out on top in most areas, except the scoreboard. “Most of the stats that we were trying to value today went our way. We won inside 50’s (57-52), we won tackles (72-67), so we just didn’t make the most of our chances,” he said. “I thought when they went forward they made the most of their opportunities. “Throughout the game we played in patches rather than really consistent footy where we eventually break teams down like we did against Richmond. Jayden Laverde made a successful return from an extended layoff with a shoulder injury, kicking three goals from 10 disposals with six marks from the forward line. James Polkinghorne led the way for the Bombers with 30 touches, running hard both into defence and attack with eight inside 50’s and three rebound 50’s. Jason Ashby stood out with 26 disposals in a key rebounding role from the defensive half. Ashby also had five marks and four rebound 50’s. Coghlan was his consistent self with 23 disposals, Sam Heavyside was lively with 21 touches, five inside 50’s and six tackles and Josh Freezer took nine marks from his 20 touches. Nash Holmes showed maturity beyond his years with 18 disposals and a team-high 10 tackles in just his second VFL game. “Polky normally plays forward and on ball but we really need him as an inside mid and he was outstanding. His contested ball work, stoppage work, clearances, his ability to spread both ways I think is really important,” Egan said. “Heavy as a forward lead-up had some real opportunity to win the game for us and he was one that probably just missed a couple chances that he could have kicked. “Holmes again for a young player in his second game, his contested ball and outnumber work is outstanding. Essendon now sit seventh on the VFL ladder with four wins and five losses, and take on Werribee on Saturday who sits in ninth on the same win-loss ledger. “We have a bit to work on but really important we recover and look forward to this week against Werribee because it becomes an even bigger game than today,” Egan said. For the second week in a row the Bombers VFL will be broadcast live on Channel 7 at 2.10pm on Saturday. Click back to essendonfc.com.au on Tuesday for more VFL content.